Massimo Capra is a well-known chef. Many people will know him from his appearances on The Food Network’s Restaurant Makeover. He is the owner of Mistura and Sopra on Davenport Road. He is also an author having published One Pot Italian Cooking and currently promoting his newest book 3 Chefs: The Kitchen Men along with Michael Bonacini (of Oliver&Bonacini) and Jason Parsons (of Peller Estates). He is incredibly friendly, enthusiastic and has such a love and passion for good food. And he has an awesome moustache! We ate at Tutti Matti on Adelaide Street. It was Massimo’s choice. Being that he is a chef, I left it up to him because I didn’t want to choose somewhere awful by accident. Massimo is a huge fan of Tutti Matti because he says it reminds him of home cooked food. If there are any imperfections in the food, it is just the way nonna would make it, which makes it that much better. Even the smells of the restaurant reminded me of my nonna’s cooking. We split the fettunta (which is like bruschetta in my non-professional opinion), Massimo had the ravioli special and I had the fettucine with meat sauce. Important to note that all the pasta was made in-house, yum! We both drank water. Total bill was $49 with tax. We talked a lot about Italian food. My mom is from Italy, actually not far from where Massimo is from, and I grew up eating Italian food. 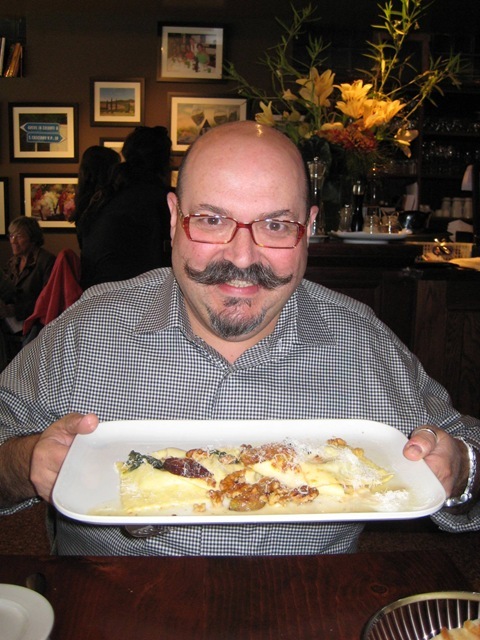 Massimo explained that he is taking traditional Italian dishes but changing them slightly and updating them into his own recipes and food that he knows his customers here in Canada will enjoy. He says the food that we eat now in Canada and the US that is labeled Italian has gone through much of the same transformation as his cuisine and is its own form of Italian food. He said in Italy, if you order a specific dish like fettunta, no matter where you get it, it will be the same. While here, chefs are all putting their own take on it and Massimo has mastered this with years of dedication. About a year ago, I saw Massimo at the Loblaws by my house when I was grocery shopping with my boyfriend. We wanted to follow him around the store and buy whatever he was getting, because we figured then we might be able to cook up the same great meal that he was making. Then we just felt awkward and gave up on the idea. But Massimo is the type of chef that cooks food that fills your kitchen with smells that are warm and comforting and is exactly the kind of food that I want to make. Massimo still likes to work in the kitchen at his restaurant. The restaurant seems to have a real family feel, his wife works there too. He has been lucky to have many members of his kitchen staff stay on for upwards of ten years. Massimo told me that a lot of his longtime employees do leave eventually but he encourages them because he believes that chefs need to go out in the world, see what’s happening and learn along the way. His ex-staff members are now working at restaurants all across the globe. Massimo told me about a new show he is working on that is currently being pitched in Cannes. It’s called Gourmet Escapes and Massimo travels around the world trying different cuisines and experiencing different cultures. So far, he has been to Iceland, South Carolina, Italy, Nova Scotia and more. Massimo told me about his time in Iceland and how much he wants to go back. He said the food is amazing, there are lots of great restaurants, a happening night life and the hot springs that everyone talks about? He said he could’ve stayed in them all day. Hearing about his new show reminded me of Anthony Bourdain’s No Reservations. I’m a huge fan of the show and so is Massimo. He told me that after watching the episode of Anthony Bourdain in Chicago, Massimo took a road trip and went to all of the same places. He said it was an amazing trip and included eating the most delicious hot dogs and tamales at a diner in a trailer. Often when I watch No Reservations, I want to go to the city and try the food. I liked that a professional chef like Massimo is also so enthusiastic and open to try out what other chefs are doing around the world. As this blog has taught me over and over again, you really never stop learning. Such an interesting guy, I really admire his passion for food! Great post, and I love the new design as well! I would love to go on “no reservations” trips! Sounds like a fabulous lunch Mary!